Because elderly patients may have diminished renal function, dose adjustments may be required according to their renal function status. In general, recommended dosing for elderly patients with normal renal function is the same as for younger adult patients with normal renal function. For patients with moderate to severe renal impairment (creatinine clearance 10 mL/min to < 50 mL/min), the maximum recommended dose of paliperidone extended-release tablets are 3 mg once daily [see Renal Impairment above]. Paliperidone Extended-release Tablets are available in the following strengths and colors: 1.5 mg (beige), 3 mg (white to off-white), 6 mg (reddish-brown), and 9 mg (blue). All tablets are capsule shaped and are imprinted with either “WPI” and “1.5”, “WPI” and “3”, “WPI” and “6”, or “WPI” and “9”. Hypersensitivity reactions, including anaphylactic reactions and angioedema, have been observed in patients treated with risperidone and paliperidone. Paliperidone is a metabolite of risperidone and is therefore contraindicated in patients with a known hypersensitivity to either paliperidone or risperidone, or to any of the excipients in paliperidone extended-release tablets. Elderly patients with dementia-related psychosis treated with antipsychotic drugs are at an increased risk of death. Paliperidone is not approved for the treatment of dementia-related psychosis [see Boxed Warning]. For the three fixed-dose efficacy studies in subjects with schizophrenia, electrocardiogram (ECG) measurements taken at various time points showed only one subject in the paliperidone 12 mg group had a change exceeding 60 msec at one time-point on Day 6 (increase of 62 msec). Given these considerations, paliperdione should be prescribed in a manner that is most likely to minimize the occurrence of tardive dyskinesia. Chronic antipsychotic treatment should generally be reserved for patients who suffer from a chronic illness that is known to respond to antipsychotic drugs. In patients who do require chronic treatment, the smallest dose and the shortest duration of treatment producing a satisfactory clinical response should be sought. The need for continued treatment should be reassessed periodically. Hyperglycemia and diabetes mellitus, in some cases extreme and associated with ketoacidosis or hyperosmolar coma or death, have been reported in patients treated with all atypical antipsychotics. These cases were, for the most part, seen in post-marketing clinical use and epidemiologic studies, not in clinical trials, and there have been few reports of hyperglycemia or diabetes in trial subjects treated with paliperidone. Assessment of the relationship between atypical antipsychotic use and glucose abnormalities is complicated by the possibility of an increased background risk of diabetes mellitus in patients with schizophrenia and the increasing incidence of diabetes mellitus in the general population. Given these confounders, the relationship between atypical antipsychotic use and hyperglycemia-related adverse events is not completely understood. However, epidemiological studies suggest an increased risk of treatment-emergent hyperglycemia-related adverse events in patients treated with the atypical antipsychotics. Because paliperidone extended-release tablets were not marketed at the time these studies were performed, it is not known if paliperidone is associated with this increased risk. Data on mean changes in body weight and the proportion of subjects meeting a weight gain criterion of ≥7% of body weight from the three placebo-controlled, 6-week, fixed-dose studies in adult subjects are presented in Table 3a. Because the paliperidone extended-release tablet is non-deformable and does not appreciably change in shape in the gastrointestinal tract, paliperidone should ordinarily not be administered to patients with pre-existing severe gastrointestinal narrowing (pathologic or iatrogenic, for example: esophageal motility disorders, small bowel inflammatory disease, “short gut” syndrome due to adhesions or decreased transit time, past history of peritonitis, cystic fibrosis, chronic intestinal pseudoobstruction, or Meckel’s diverticulum). There have been rare reports of obstructive symptoms in patients with known strictures in association with the ingestion of drugs in non-deformable controlled-release formulations. 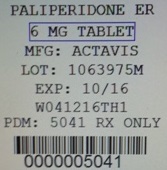 Because of the controlled-release design of the tablet, paliperidone should only be used in patients who are able to swallow the tablet whole [see Dosage and Administration (2.3) and Patient Counseling Information (17.8)]. Patients with clinically significant neutropenia should be carefully monitored for fever or other symptoms or signs of infection and treated promptly if such symptoms or signs occur. Patients with severe neutropenia (absolute neutrophil count <1000/mm3) should discontinue paliperidone and have their WBC followed until recovery. The possibility of suicide attempt is inherent in psychotic illnesses, and close supervision of high-risk patients should accompany drug therapy. Prescriptions for paliperidone should be written for the smallest quantity of tablets consistent with good patient management in order to reduce the risk of overdose. The safety of paliperidone was evaluated in 150 adolescent subjects 12-17 years of age with schizophrenia who received paliperidone in the dose range of 1.5 mg to 12 mg/day in a 6-week, double-blind, placebo-controlled trial. *Table includes adverse reactions that were reported in 2% or more of subjects in any of the paliperidone dose groups and which occurred at greater incidence than in the placebo group. Data are pooled from three studies; one study included once-daily paliperidone doses of 3 mg and 9 mg, the second study included 6 mg, 9 mg, and 12 mg, and the third study included 6 mg and 12 mg [see Clinical Studies (14)]. Extrapyramidal symptoms includes the terms dyskinesia, dystonia, extrapyramidal disorder, hypertonia, muscle rigidity, oculogyration, parkinsonism, and tremor. Somnolence includes the terms sedation and somnolence. Tachycardia includes the terms tachycardia, sinus tachycardia, and heart rate increased. Adverse reactions for which the paliperidone incidence was equal to or less than placebo are not listed in the table, but included the following: vomiting. *Table includes adverse reactions that were reported in 2% or more of subjects in any of the paliperidone dose groups and which occurred at greater incidence than in the placebo group. Data are pooled from two studies. One study included once-daily paliperidone doses of 6 mg (with the option to reduce to 3 mg) and 12 mg (with the option to reduce to 9 mg). The second study included flexible once-daily doses of 3 to 12 mg. Among the 420 subjects treated with paliperidone, 230 (55%) received paliperidone as monotherapy and 190 (45%) received paliperidone as an adjunct to mood stabilizers and/or antidepressants. Extrapyramidal symptoms includes the terms bradykinesia, drooling, dyskinesia, dystonia, hypertonia, muscle rigidity, muscle twitching, oculogyration, parkinsonian gait, parkinsonism, restlessness, and tremor. Somnolence includes the terms sedation and somnolence. Tachycardia includes the terms tachycardia, sinus tachycardia, and heart rate increased. The percentages of subjects who discontinued due to adverse reactions in the two schizoaffective disorder placebo-controlled 6-week studies in adults were 1% and <1% in paliperidone - and placebo-treated subjects, respectively. The most common reasons for discontinuation were gastrointestinal disorders (1% and 0% in paliperidone - and placebo-treated subjects, respectively). In a drug interaction study, co-administration of paliperidone (12 mg once daily for 5 days) with divalproex sodium extended-release tablets (500 mg to 2000 mg once daily) did not affect the steady-state pharmacokinetics (AUC24h and Cmax,ss) of valproate in 13 patients stabilized on valproate. In a clinical study, subjects on stable doses of valproate had comparable valproate average plasma concentrations when paliperidone 3 to 15 mg/day was added to their existing valproate treatment. Co-administration of Paliperidone 6 mg once daily with carbamazepine, a strong inducer of both CYP3A4 and P-glycoprotein (P-gp), at 200 mg twice daily caused a decrease of approximately 37% in the mean steady-state Cmax and AUC of paliperidone. This decrease is caused, to a substantial degree, by a 35% increase in renal clearance of paliperidone. A minor decrease in the amount of drug excreted unchanged in the urine suggests that there was little effect on the CYP metabolism or bioavailability of paliperidone during carbamazepine co-administration. On initiation of carbamazepine, the dose of paliperidone should be re-evaluated and increased if necessary. Conversely, on discontinuation of carbamazepine, the dose of paliperidone should be re-evaluated and decreased if necessary. Co-administration of a single dose of paliperidone 12 mg with divalproex sodium extended-release tablets (two 500 mg tablets once daily) resulted in an increase of approximately 50% in the Cmax and AUC of paliperidone. Dosage reduction for paliperidone should be considered when paliperidone is co-administered with valproate after clinical assessment. There are no adequate and well controlled studies of paliperidone in pregnant women. Paliperidone should be used during pregnancy only if the potential benefit justifies the potential risk to the fetus. In a study in which juvenile rats were treated with oral paliperidone from days 24 to 73 of age, a reversible impairment of performance in a test of learning and memory was seen, in females only, with a no-effect dose of 0.63 mg/kg/day, which produced plasma levels (AUC) of paliperidone similar to those in adolescents. No other consistent effects on neurobehavioral or reproductive development were seen up to the highest dose tested (2.5 mg/kg/day), which produced plasma levels of paliperidone 2 to 3 times those in adolescents. Paliperidone Extended-release Tablets are available in 1.5 mg (beige), 3 mg (white to off-white), 6 mg (reddish-brown), and 9 mg (blue) strengths. Inactive ingredients are butylated hydroxytoluene, cellulose acetate, colloidal silicon dioxide, FD&C red # 40 aluminum lake HT, hydroxypropyl cellulose, hypromellose, iron oxide black, polyethylene glycol, polyethylene oxide, povidone, propylene glycol, sodium chloride, stearic acid and titanium dioxide. The 1.5 mg tablets also contain iron oxide yellow, iron oxide red, polyvinyl alcohol and talc. The 3 mg tablets also contain lactose monohydrate and triacetin. The 6 mg tablets also contain iron oxide red, polyvinyl alcohol and talc. The 9 mg tablets also contain FD&C blue # 2, polydextrose and triacetin. The acute efficacy of paliperidone (3 mg to 15 mg once daily) was established in three placebo-controlled and active-controlled (olanzapine), 6-week, fixed-dose trials in non-elderly adult subjects (mean age of 37) who met DSM-IV criteria for schizophrenia. Studies were carried out in North America, Eastern Europe, Western Europe, and Asia. The doses studied among these three trials included 3 mg/day, 6 mg/day, 9 mg/day, 12 mg/day, and 15 mg/day. Dosing was in the morning without regard to meals. In a longer-term trial, adult outpatients meeting DSM-IV criteria for schizophrenia who had clinically responded (defined as PANSS score ≤ 70 or ≤ 4 on pre-defined PANSS subscales, as well as having been on a stable fixed dose of paliperidone for the last two weeks of an 8-week run-in phase) were entered into a 6-week open-label stabilization phase where they received paliperidone (doses ranging from 3 mg to 15 mg once daily). After the stabilization phase, patients were randomized in a double-blind manner to either continue on paliperidone at their achieved stable dose, or to placebo, until they experienced a relapse of schizophrenia symptoms. Relapse was pre-defined as significant increase in PANSS (or pre-defined PANSS subscales), hospitalization, clinically significant suicidal or homicidal ideation, or deliberate injury to self or others. An interim analysis of the data showed a significantly longer time to relapse in patients treated with paliperidone compared to placebo, and the trial was stopped early because maintenance of efficacy was demonstrated. The efficacy of paliperidone in adolescent subjects with schizophrenia was established in a randomized, double-blind, parallel-group, placebo-controlled, 6-week study using a fixed-dose weight-based treatment group design over the dose range of 1.5 to 12 mg/day. The study was carried out in the US, India, Romania, Russia, and Ukraine, and involved subjects 12 to 17 years of age meeting DSM-IV criteria for schizophrenia, with diagnosis confirmation using the Kiddie Schedule for Affective Disorders and Schizophrenia-Present and Lifetime Version (K-SADSPL). As paliperidone has the potential to impair judgment, thinking, or motor skills, patients should be cautioned about operating hazardous machinery, including automobiles, until they are reasonably certain that paliperidone therapy does not affect them adversely [see Warnings and Precautions (5.11)]. Patients should be advised to notify their physician if they become pregnant or intend to become pregnant during treatment with paliperidone [see Use in Specific Populations (8.1)]. Caution should be exercised when paliperidone is administered to a nursing woman. The known benefits of breastfeeding should be weighed against the unknown risks of infant exposure to paliperidone. [See Use in Specific Populations (8.3)].